NEW ORLEANS (CNS) — The idea of making a walking pilgrimage in the United States took root about four years ago when Dominican Fathers Francis Orozco and Thomas Schaefgen were studying together for the priesthood. They saw the movie, “The Way,” featuring Martin Sheen, who portrayed a father honoring his late son’s memory by completing the 450-mile Camino de Santiago, the “Way of St. James,” a pilgrimage route across Spain taken for centuries by pilgrims. 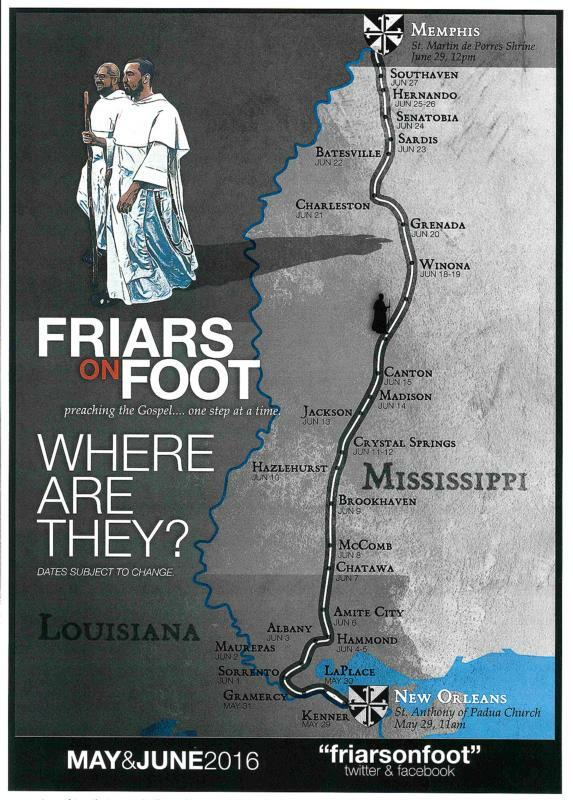 From that seed sprouted “Friars on Foot,” a 478-mile pilgrimage on foot from New Orleans to Memphis, Tennessee, which will begin after the 11 a.m. Mass at St. Anthony of Padua Church in New Orleans May 29 and arrive in Memphis June 29. The friars plan to stay overnight at Catholic churches or with Catholic families along the way, celebrating Mass and even giving history and vocation talks about the 800-year-old congregation — the Order of Preachers — whose earliest members were itinerant preachers, walking from town to town. They will average about 16 miles a day. There are only two stops in Mississippi without Catholic churches — Pickens and West — and on those nights they probably will stay at a local Protestant church.